Archie's British Birding Blog Deluxe: Possible ATLAS FLYCATCHER in Yorkshire! Possible ATLAS FLYCATCHER in Yorkshire! The 'Birding Emperor of East Yorkshire'; Sir Brett Richards located a funky looking first summer male ficedula at Flamborough last Saturday and Mmmmmm it looked to be a pretty interesting bird indeed. With no sign of it on Sunday it was then relocated along Lighthouse Road on the Monday. At this stage the mystery bird was caught and processed and then released nearby amidst the wooded ravine of South Landing. The measurements taken fell within those expected of ATLAS FLYCATCHER but a bird of this particular age is not safely identified on plumage alone. With this in mind a few precious feathers that became loose were safely collected in the hope that DNA analysis could clinch the identification for certain. Other possibilities are that the bird is an Iberian Pied Flycatcher or maybe a hybrid Pied x Collared Flycatcher. Throughout the week the bird's identity was discussed at great length, see Surfbirds for one of the best internet discussions. With other ATLAS FLYCATCHERS being claimed elsewhere in Europe this Spring: two in mainland Italy, two on Sicily, one in Spain and another dodging the trappers on Malta, surely this increases the probability that we could have a British first on our tick-hungry hands? The Funky Flamborough Ficedula... but what is it? With the debate continuing I eventually cracked under the immense pressure and managed to take the afternoon off work this afternoon. I had a good feeling in my bones that this bird could be the next 'big one' and I did not want to miss the possible opportunity of a lifetime. The journey from Birmingham to Bridlington (via Coventry) went smoothly enough and just after 3.00pm we arrived on site. Initially the bird was quite elusive but after a bit of perseverance we eventually enjoyed superb views of it along the south east side of the valley. At one stage it called continuously for about a minute as it fed close to a roosting Tawny Owl. It was not reminiscent of the sharp hwit call of the familiar Pied Flycatcher but was more like a subtle hweeet type sound. Happy that we had witnessed all of the prime features for ourselves we then made our way back to the car park via the seaward end of the ravine. 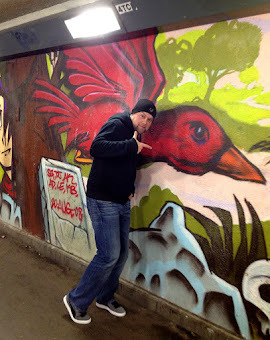 As we climbed the steep hill I picked up the bird yet again and even closer views were obtained this time. ..... and so we all await the results of the DNA analysis with baited breath! ATLAS FLYCATCHER... the story so far! Back in the days the humble Pied Flycatcher Ficedula hypoleuca was spilt into four different subspecies. 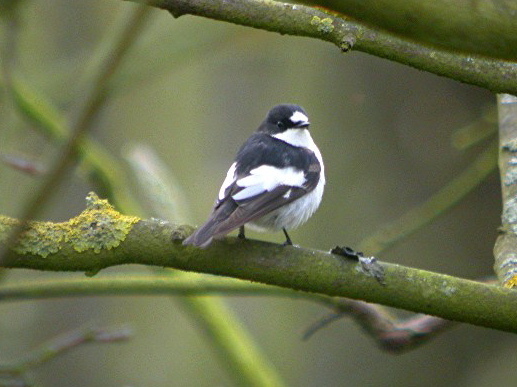 The race that breeds in Britain and other areas of northern and western Europe is F. h. hypoleuca and known as European or Western Pied Flycatcher. Further east the race F. h. sibirica or Siberian Pied Flycatcher breeds east of the Ural mountain range. Down in south west Europe the race F. h. iberiae or Iberian Pied Flycatcher has a localised breeding range in southern Spain and Portugal. The final race in the group was F. h. speculigera that breeds across the Mediterranean along the Atlas mountain range of north west Africa. The structure above was then revised during 2001 when the DNA diversity of the 'black & white flycatcher' complex was studied in more detail. The news at this time surprised most birders when it was discovered that Semi-collared Flycatcher was the ancestor of both Pied Flycatcher and Collared Flycatcher and that these were more closely related to each other than either of them was to Semi-collared Flycatcher. In addition it was also realised that the 'race' breeding in north west Africa was both phylogenetically and morphologically distinct. As a result of this conclusion the authors of the study recommended that this form should be treated as a separate species and named Atlas Flycatcher. The genetic distance of this 'new' species suggested that genetically it was further diverged from both Pied and Collared Flycatchers than they actually are from each other. Atlas Flycatcher arrives on its breeding grounds at the end of April. It has been recorded on migration in Senegal and Algeria and there is just a single winter record from the Ivory Coast. Back in 2003 Graham Etherington and Brian Small mentioned in their Birding World identification article that there was a possibility as with all trans-Saharan migrants that there was a chance of spring overshoots occurring in Britain and north west Europe. They also stated that the end of April or the beginning of May would be the most likely period for their arrival here. Could their prophecy come true over the next few weeks? The DNA results have now been received! Martin Collinson and his students at Aberdeen University have concluded that the bird is actually a European Pied Flycatcher. Surely such a shocking announcement as this should have been televised live on The Jeremy Kyle Show.